CENTRAL FLORIDA CORN is in season. That’s great news for folks who make toothpicks. 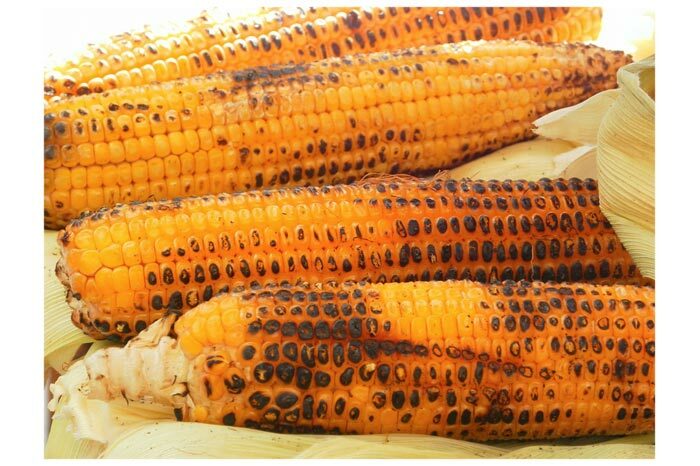 And grilling vegetables doesn’t get much easier than corn. What other food, other than meat, comes off the coals with its own handle? Pull off the heavy, outer husks and throw them in the compost pile. Pull back the softer, inner husks and remove the silk. Soak the corn in water (a cooler works great for this) about an hour. Drain the corn and pat it dry. Grill the corn uncovered about a half hour. Using new garden gloves or tongs, pull back the husks and drizzle or spread or dip with whatever flavored butter you choose. Mix chili powder with soft butter, as much spice as your tongue can stand. Simmer garlic in butter until the butter smells fragrant. Stir curry powder into soft butter. Lemon zest or orange zest add a new dimension. Sweet spices — cinnamon, nutmeg allspice, cardamom – with butter yield an almost dessert quality to already-sweet corn. Dilute store-bought pesto with mild olive oil. It should say somewhere in a grilling bible that roasted corn has to be part of Pico di Gallo. Pico recipes are loosey-goosey for quantity. It depends on what you like. Basically: Mix 2 cups of roasted corn off the cob kernels, 2 cups of canned black beans (rinsed and drained), 1/2 cup chopped onion, a chopped red or green pepper, 2 cups of chopped tomato, chopped jalapenos, cilantro, cumin, salt and pepper and anything else you can think of with fresh lime juice. Let it chill for at least an hour for the flavors to blend. Serve it with grilled skirt steak sliced across the grain. Or chicken, or pork, or burgers, or hot dogs. You get the idea. Zucchini is a natural for grilling because it’s wide enough to not fall into the coals. And here is where some of your flavored butter works, too. Split the zucchini (or yellow squash) lengthwise. Slash the flat side in diamond patterns. Oil both sides of the vegetable and put it on a cool part of the grill, skin side down. Turn when the skin is well marked. Turn back when it’s almost done and sprinkle with some of the butter if you like and finish with plenty of grated parmesan, Romano or asiago cheese. Leave it long enough to melt the cheese. We don’t think of avocado as a grillable fruit, but it is. Buy yours far enough ahead of grilling day so they can ripen until a little soft to the touch. Cut them in half and remove the pit. Oil the cut side and put them face-down on a medium grill until they are marked and starting to get a little crusty. Time depends on the heat. The outside darkens and the inside softens. Use a turner to take them off the grill. Serve as a side dish filled to the brim with the corn and black bean Pico.